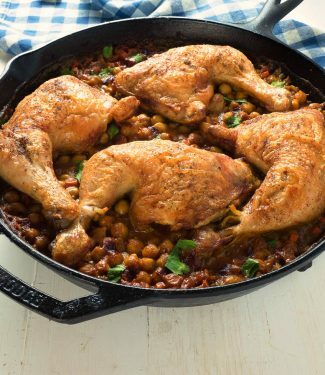 Moroccan chicken and chickpeas. That’s a pretty broad description. This version is a warm dish of onion, garlic, spices and peanut butter. The chicken stays crispy and the chickpeas get meltingly delicious. It just works. And it works well. 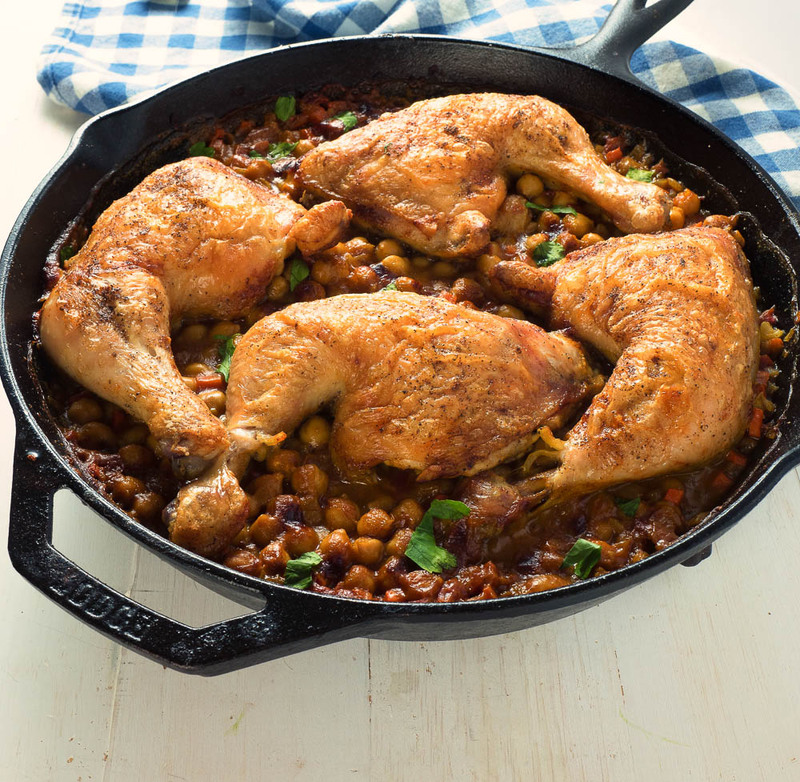 Moroccan chicken and chickpeas is one skillet dish that I’ve been making forever. It’s not particularly authentic, I don’t think. But it’s really good. One of those homey style dishes that hits the spot. I adapted the recipe from a small lunch cafe years ago. They called it Moroccan chicken. Good enough for me. I upped the spice some and added some of the Ethiopian berbere chili powder. That’s wonderful stuff. If you’ve never tried it, I urge you to. It’s a mix of spices and Ethiopian chilies and it’s absolutely haunting. The one trick in this recipe is to keep the chicken on top of the chickpeas when it’s in the oven. The juices from the chicken drip into the chickpeas. The skin stays crispy. Everything comes out perfect. 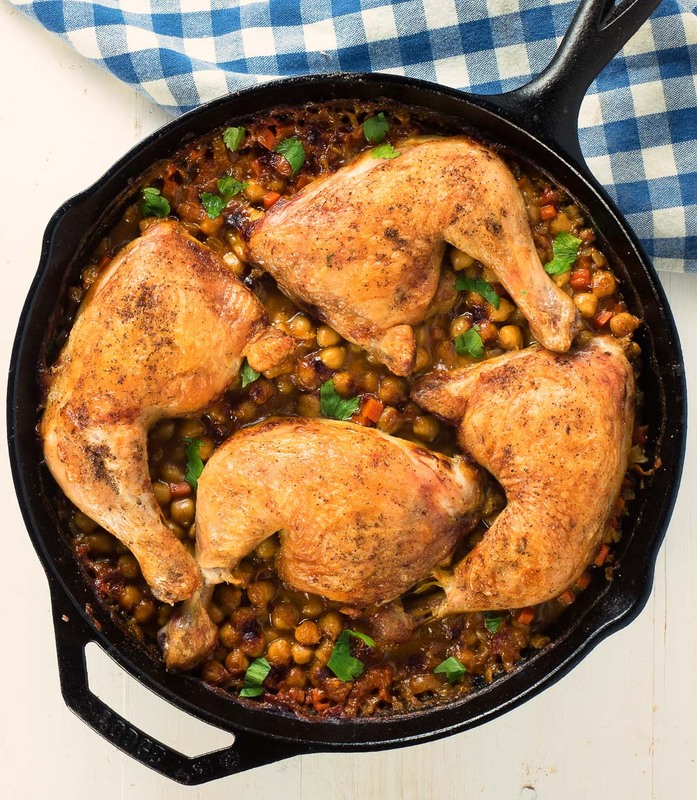 Moroccan chicken and chickpeas is a simple, delicious, one skillet meal that comes together in under an hour. Heat enough oil in an oven-proof skillet large enough to hold all the ingredients. When the oil is shimmering, place the chicken, skin side down and brown. This should take 3-4 minutes. Turn the chicken over and brown another 3-4 minutes. Remove the chicken from the pan and spoon off all but 3 Tbsp of the fat. Add the onions and carrots and cook until the onions are translucent and just start to brown. Stir in the garlic and cook a minute more. Add 1/4 cup of stock, the curry powder, cumin powder and Ethiopian chili powder and stir. Now add the peanut butter and stir to combine. Add the remaining stock and chickpeas. Place the chicken overtop and bring to a simmer. Place the skillet in the oven and cook until the chicken registers 175F in the thigh. This takes 20-30 minutes. Serve chicken overtop a mound of chickpea curry. So glad you like it. This one is a sleeper on the blog. I love it but nobody seems to get it. Thank you for commenting!